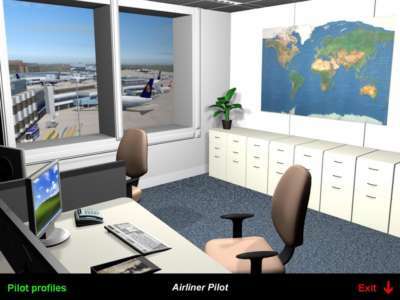 The popularity of Virtual Airlines demonstrates that many flight simulation enthusiasts want to enjoy the whole commercial aircraft experience - not just piloting a plane from A to B. Up to now there's been nothing to replicate airline operations, but Airliner Pilot is a unique expansion for FS2004 that fills this gap. You begin your Airliner Pilot career at the heart of a fictional airline and start as a Junior First Officer in the right-hand seat of a turboprop aircraft. Flying your way through the program, you work your way through a pilot's career. 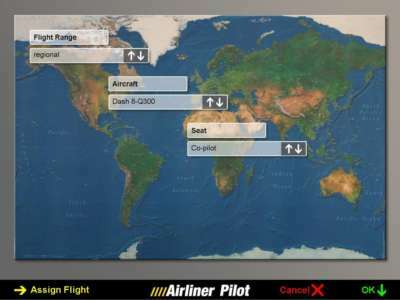 The airline will assign routes for you to fly according to rank and aircraft allowances - and, if successful, you finally achieve the coveted left seat! 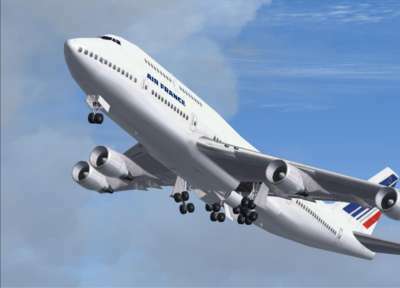 This product was the Winner of Aircraft Illustrated's prestigious award for Best Flight Sim Product of 2005. 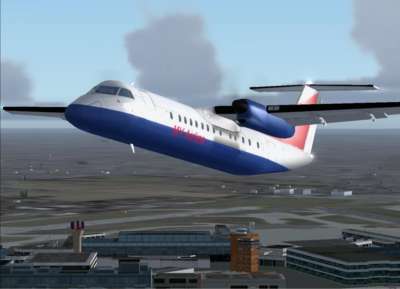 They wrote: "This creates a whole new challenge for users of Flight Simulator. It is great fun, easy to use and one of those titles that you find yourself going back to time and again, which is a sign of a great product. We were also very impressed with the rapid response from the publisher when needing help and Airliner Pilot even has its own web site, www.airlinerpilot.com, where fans are adding their own extras to make the experience even more enjoyable." Have you ever wanted to fly for a major airline? Fancy travelling the world, being responsible for millions of pounds worth of material and for the safety and comfort of hundreds of passengers? Wouldn't it be great if you could do it in FS2004? Now you can. 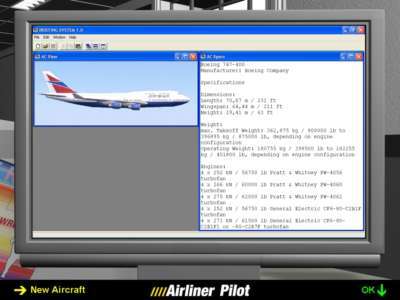 Airliner Pilot is a unique piece of software that puts you in control of an airliner in your own fictional airline. Starting as a Junior First Officer in the right-hand seat of a turboprop aircraft, you'll make your way through a pilot's career. Your airline will assign you routes to fly according to your rank and aircraft allowances. With growing experience and successful flying you will gain type ratings for larger aircraft on longer routes and eventually be promoted to take the Captain's place in the left-hand seat. Career ranks: Junior First Officer, First Officer, Senior First Officer, Captain, Training Captain. The pilot will be promoted when he or she successfully completes a number of flights and a number of flying hours. The hours are determined according to which options you choose. Aircraft to fly: Dash 8 Q300 turboprop, Boeing 737-400 (default model), Boeing 777 (default model), Boeing 747-400 (default model). 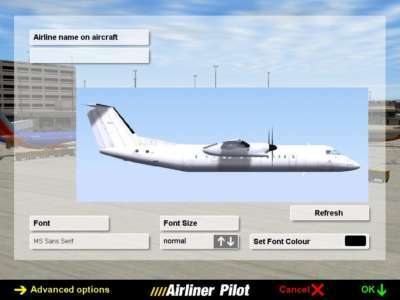 At the beginning of the program only the Dash 8 will be available for flying. After a number of successfully completed flights the 737 will be available. To fly the 777, several hours on the 737 will be required and so on. 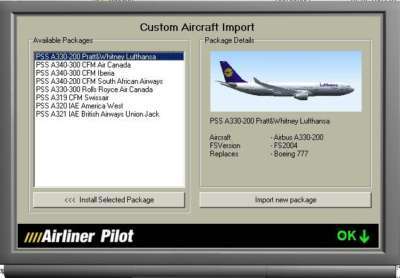 Custom airline design - the program allows fictional airlines to be used in order to create an individual airline for each player. 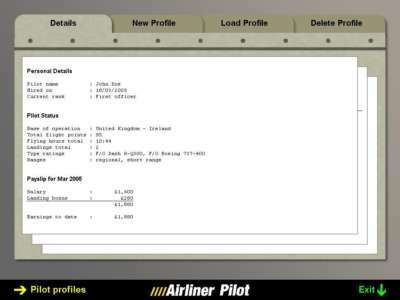 The user can enter a name for his airline. Real World airline liveries - you can choose to fly for Air France, British Airways, Iberia, Lufthansa, KLM or United. Custom aircraft liveries - various custom liveries can be selected and even the airline name can be printed into the aircraft livery. Different career modes (Regular, Short, Extended) and difficulty levels are available to take account of the user's skill levels. 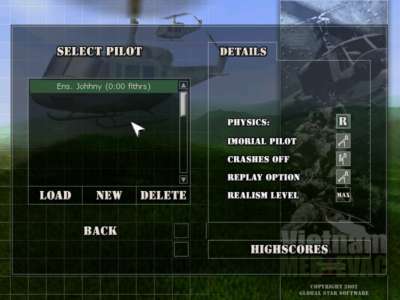 Flight Ops (Flight Operations) program provides all player administration, career simulation and pre-/post-flight simulations to provide the main game play, including flight assignments, flight plans and briefings, debriefing, evaluating player's performance, promotions (demotions), type ratings, providing the aircraft to fly. Routes to fly (according to the aircraft used) will vary between Regional (National), short range (Short International), Medium range (Long International) and long range (Inter-Continental). Co-pilot and (later) Captain seat positions available. Homebase Regions - the player will select a homebase region (i.e. UK, Germany, USA, Asia etc.) for his airline. Routes to fly will consider the homebase region (i.e. regional flights will only fly within the homebase region). 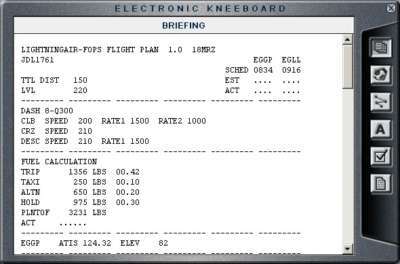 Flights will be assigned by the Flight Ops program according to a pilots experience and aircraft type ratings. There are about 1,500 individual pre-planned flights worldwide, from regional to intercontinental - more flying than anyone will ever want! Briefings include full route details including navigation aids, fuel load required and weather reports, along with all the necessary information included to successfully complete the flight. Briefings can be printed out. 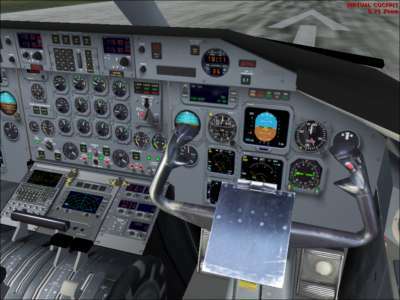 The player can fly the routes under FS ATC guidance. Route Tracker monitors the progress of your flight from start-up to shut-down and looks and works like a mini FMC (Flight Management Computer). The Route Tracker monitors your performance on each flight you make and evaluates your performance on completing them. During each flight it will display the following data: Next Waypoint, Distance to Waypoint, Heading to Waypoint, Estimated Arrival Time at the Next Waypoint and Estimated Arrival Time at the Destination Airport. 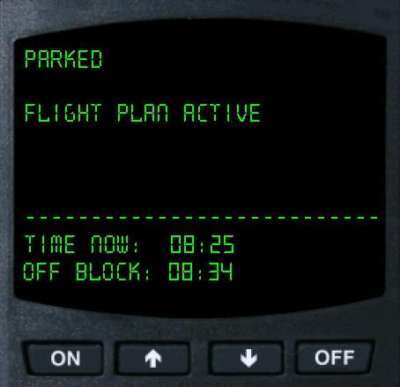 In addition the Route Tracker will track your flight for accuracy on departure time, waypoint accuracy, correct altitudes, abnormal flight envelope departures such as excessive 'G' or stalling, arrival time, engines off time, and after completing the flight the Tracker will pass back the results to the Flight Ops program for evaluation and assessment. 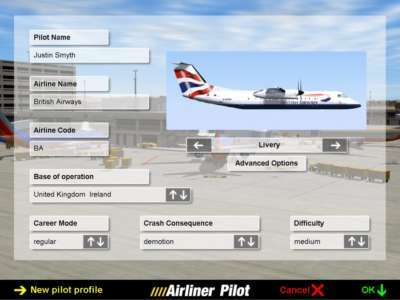 To consider a flight as successful, the player will have to match the set times and fly the aircraft and route correctly with regard to the difficulty levels and tolerances that have been set. The difficulty levels will increase over time with player experience and according to pre-set difficulty levels. A full German manual is available to download from the Support section. 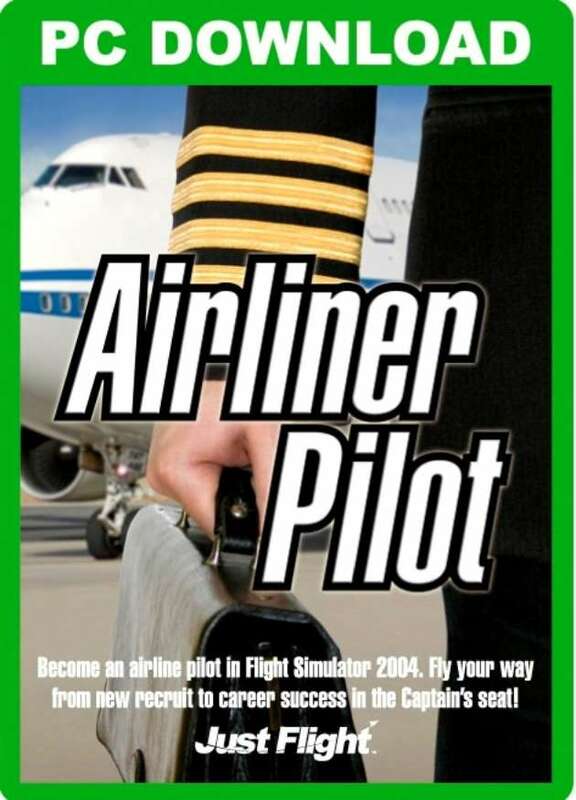 Become an airline pilot in Flight Simulator 2004 - fly your way from new recruit to career success in the Captain s seat! Begin your Airliner Pilot career at the heart of a fictional airline and start as a Junior First Officer in the right-hand seat of a turboprop aircraft. Flying your way through the program, you work your way through a pilot's career. The airline will assign routes for you to fly according to rank and aircraft allowances. If you’re successful, you’ll finally achieve the coveted left seat!